This commercial grade banquet chair with trapezoidal back design fits well in formal and casual settings from wedding ceremonies to corporate meetings and awards banquets.The chair's cushioned back and 1.5 inch thick seat are padded with CA117 fire retardant foam and covered with durable vinyl upholstery. Its sturdy, 16 gauge steel, powder coated frame, with gracefully angled legs, has been tested to hold up to 500 pounds. Double support braces reinforce the frame to give it great strength and durability. 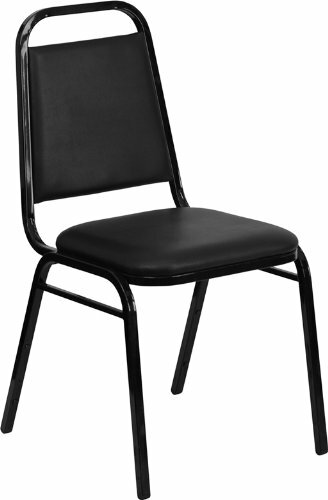 Bumper guards prevent scratches on the frame when stacked (up to 15 high) and non-marring floor glides protect your floor by sliding smoothly when you need to move the chair.The Hercules Banquet Chair is an excellent option for churches, banquet halls, training rooms, hotels, convention centers and schools.